Birds gotta fly, fish gotta swim and dogs gotta chew. But as much as dogs love it, the painful dental problems that sometimes accompany their chomping habits aren’t quite as enjoyable. A broken tooth exposes the delicate pulp and nerve endings, making life extremely painful for the pet. Food and other debris can get impacted in the fracture and attract bacteria, leading to infection, the loss of a tooth or worse. In other words, it’s not much fun. The most common signs of dental problems are excessive drooling (especially in a pet who doesn’t normally salivate much), not eating or favoring one side of the mouth. 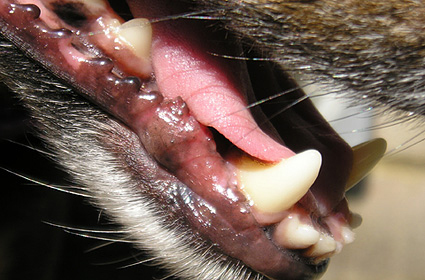 Broken teeth are unfortunately a common problem with dogs. Aggressive chewing on hard objects (rocks, fencing, etc.) or on hard treats (cow hooves, bones and hard nylon toys) are the primary cause. To prevent broken teeth and destructive chewing, dental experts recommend regular exercise and special doc-approved toys to distract them from the bad ones. For extremely aggressive chewers, get a large toy the pet can’t get his mouth around or offer softer chews. Veterinarian’s rule of thumb: Don’t give your pet any chew toy that’s hard enough that you wouldn’t want it to hit you in the knee. Just as the human family gets regular dental examinations and cleanings, you should take your pet to the veterinarian at least yearly for a comprehensive physical examination that will include a look at your pet’s entire mouth. If your pet is having problems sooner, don’t wait for the well-pet exam — dental problems really hurt! Dental cleanings under anesthesia are a regular part of a preventive-care regimen for many dogs, as is at-home care such as brushing. Ask your veterinarian what’s best for your pet’s teeth and gums, both to prevent problems and to fix them.